This forth Regional Report includes an updated overview, including some analysis, about the people of Project Management in Italy, and, in its second part, an outline about Certifications in Italy, including an interesting contribution by Vito Introna, Associate Professor at University of Rome Tor Vergata. If we consider the number of Certifications in Project Management that have been issued in 2018 as the best objective Key Performance Indicator of Project Management discipline, as may be it is appropriate, all figures confirm the extremely positive trend of last years: indeed, the overall number of certified Project Management practitioners plenty exceeded 20.000¹, and the 2017’s trend of about 15% increase, which has been the greatest of all time in Italy, was almost confirmed. Approximately, while project management certifications started to be released in Italy 20 years ago, almost 2/3 of them has been issued in last five years: in particular, about 52% of total 20.000 certifications have been released by Istituto Italiano di Project management, ISIPM in short, 40% by PMI, and 8% by IPMA, respectively. In general, considering the total number of certifications, about 60% are Basic (ISIPM-Base, CAPM, etc. ), while 40% are Advanced (PMP, ISIPM-Av, etc.). In 2018, there were more than 2.000 Basic Certifications (96% ISIPM-Base, 4% CAPM), and almost 1.000 Advanced Certifications (about 70% PMP, 30% ISIPM-Av): it is absolutely remarkable both that ISIPM exceeded significantly the number of 10.000 certifications, and that, in few years, the Certification ISIPM Av succeeded to gain a share of 30% of the market. From the analytical perspective, 2018 has been characterized by two greatly positive trends: first, a great increase in the number of project management certifications from the Public Administrations, and, second, a significant success of the approach “management by projects”, which uses project management discipline to target higher performances in efficacy and efficiency, not only in managing projects, but in managing operations and/or processes, too. The National Certifications of the Italian independent Istituto Italiano di Project Management (Italian Institute of Project Management, ISIPM for short), i.e. the Basic ISIPM Base and the Advanced ISIPM Av, are both coherent with International Standards, as ISO 21500:2012 and PMBOK® GUIDE Sixth Edition, while ISIPM Av, moreover, conforms to ISO 21500. In general, the major Project Management Associations that operate in Italy are the National ISIPM, the International Project Management Institute, which is structured in three Chapters (PMI Northern Italy Chapter, PMI Central Italy Chapter, PMI Southern Italy Chapter), and also the International Project Management Association (IPMA), which is represented by its Member Association IPMA Italy. Each of these three organizations offers its own certification path in Project management, both at Basic and Advanced Levels: it can be interesting to notice that, in all Europe, in terms of Advanced Certifications, ISIPM, together with the largest National Association, the British APM – Association for Project Management, are the only National Project Management Associations that provide a “National Independent Certification Path”. The Project Management Institute (PMI) published Managing Change in Organizations: A Practice Guide (2013) to provide real-world advice on change management. How Successful Organizations Implement Change is intended to expand on that practice guide by offering lessons learned, best practices, know-how and insights to organizational change management professionals. How Successful Organizations Implement Change is a collaborative work designed to help practitioners increase their effectiveness in delivering value to stakeholders during organizational change efforts. The authors solicited input, stories and advice from multiple subject matter experts across a wide variety of industries. The result is a compilation of best practice guidance, tips, tools and techniques designed to ensure the reader can lead any change effort, large or small, to a successful outcome. It aligns with PMI’s Managing Change in Organizations: A Practice Guide (2013) and integrates concepts of organizational change management with organizational project management. This book is meant to be an ongoing resource for both current and future change leaders. How Successful Organizations Implement Change consists of 14 Chapters, each written by a different contributor. Each contributor is a seasoned professional with up to 30 years of practical experience gained around the world in Spain, France and the United States. ABOUT THE CONTRIBUTORS: describes the credentials and experience of each subject matter expert. PREFACE: describes the background and intent of the book along with an overview of each chapter. PART I includes Chapters 1 through 4 and summarizes the history of project management, explains the complexities of organizational change management, and explains the importance of organizational agility. PART II includes Chapters 5 through 10 covering the change process, how agile approaches can help implement change, how organizational culture impacts change, the role of stakeholders, key measurements, and ways to sustain organizational change after implementation. PART III includes Chapters 11 through 14 and discusses building and leading the change team, the importance of sponsors, and concluding with an overview of organizational change as it relates to portfolio, program and project management. This book is written and formatted in textbook style with end of chapter review questions. Answers are provided at the end of the book and checklists and templates are also included for practical use. How Successful Organizations Implement Change takes the reader on a journey from the beginnings of project management through today’s intersection with change management. It provides detailed guidance through genuine case studies and business examples that demonstrate the do’s and don’ts of change management. Ava C. Jones is a Sr. Project Controls Manager for the Information Technology (IT) office of the Washington Metropolitan Area Transit Authority (WMATA). She provides governance, oversight, and tracking support for an IT project portfolio with a combined budget of over $100 million. Her professional background includes project management, training, software development, and systems analysis. Ava holds a MSc in Technology Management, is a certified Project Management Professional (PMP), and is also a Distinguished Toastmaster (DTM). Ava lives and works in the Washington, DC Metro Area in the United States. Editor’s note: This book review was the result of a partnership between the publisher, PM World and the PMI Silver Spring Maryland Chapter. Authors and publishers provide the books to PM World; books are delivered to the PMI Silver Spring Chapter, where they are offered free to PMI members to review; book reviews are published in the PM World Journal and PM World Library. PMI Silver Spring Chapter members can keep the books as well as claim PDUs for PMP recertification when their reviews are published. 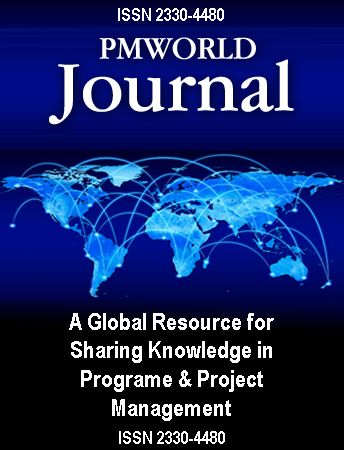 If you are an author or publisher of a project management-related book, and would like the book reviewed through this program, please contact editor@pmworldjournal.net. I always enjoy professional Congresses and Seminars as speaker but also as an attendee. When I joined PMI twenty-six years ago, I never thought how my professional career as a project manager would be positively affected by attending to professional Congresses worldwide. Most of my professional life I worked for multinational companies that requested me to do performance evaluations every year. One of the results from those evaluations was my development plan. I was lucky because one of the things my managers did was give me the freedom of choosing the activities that I needed to do to accomplish my objectives. When I discovered PMI in 1992 a big window was opened for me. I can remember that I asked my manager to go to my first Project Management Congress. At the beginning his response was negative, and also he asked me why I wanted to travel so far away. I prepared my arguments and offered him to prepare a report with a summary of my lessons learned in the Congress. I achieved my goal and I went to my first PMI Congress. It was the beginning a never end story about learning and developing my professional career. In my particular case I met several professionals at PMI Congresses that were key for my career development. More and more every year I prepared my paper submission to contribute and have the opportunity to come back again and again and again. Now after 25 years of PMI membership and almost 20 years as volunteer in different PMI roles I need to say that joining PMI was key for my career success. One of my lessons learned is that “you need to build up your future”. If you do not do it, nobody will. In my first Congress I met a great professional who gave the opportunity to learn from him, who encouraged me to write articles, with whom I have 20 years of friendship and I coauthored four books (Randall L. Englund). Personal Vision: At the end of every year spend some type thinking and writing your PERSONAL VISION, work on what is your vision personally, professionally, socially. Then you will move through your mission and objectives, finalizing with your action plan. Chose a mentor: You need to choose a mentor. Think about somebody who you are confident with. Somebody who may orient you in your career, somebody ready to listen to you. He or she will not give you all the solutions but will be a great help in your development. Use your courage: If you want to develop yourself, you need to try to do things you are not still ready to do. Try to do some activities that will allow you to grow as a person but also as a professional.